At the Public Interest Law Centre we are lawyers and campaigners who use law to help individuals win their case. However, using that case to change the law, or practice for a wide a group as possible is also a goal. Even better that the case is popularised amongst many people, so not only is the law and rights better known but it can be used widely. We see strategic litigation as giving a voice to the voiceless for working class communities and marginalised groups in particular. At its heart strategic litigation must have a strong, bold and wide campaign. In our minds strategic litigation can be conducted in any court, local or national, or before international judicial and quasi-judicial bodies. Strategic Litigation has been used for many years to advance many civil, political and socio-economic rights. Indeed lawyers from the Public Interest Law Centre brought the case of Tigere to court which had a wider and very significant impact for many other young people who had been excluded from accessing student financial support because of their immigration status. 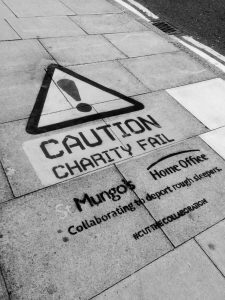 Most recently in the case of Gureckis and others we overturned a Home Office policy that had effectively detained and removed street homeless EEA migrants. As part of that case we worked with campaigners from North East London Migrant Action to set up a weekly advice sessions and build a wide broad based campaign to not only ensure that those affected were aware of their rights, but those who had not yet been directly affected, but would better know their rights as a result. Our strategic litigation also seeks to expose the unlawful nature of the policy as a whole, and to challenge policy makers directly. The aim in much of our casework is not just simply winning legal arguments in court – essential though that is – we seek to use our legal case to create awareness and publicise the cause for which the litigation itself is mobilised, encouraging public debate, set important precedents, achieve change for people in similar situations, spark policy changes and changes in the law. Not much to ask really! The public interest law movement is international – we want to play our small role in that movement.